The Incredibles is already a dark movie at points — It deals with ideas of individuality and conformity, even if it is in a wacky cartoon shell. I'm just glad The Dark Knight director Chris Nolan didn't get his hands on it. 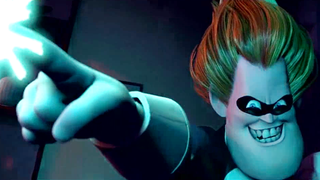 In the video above, Youtuber Bobby Burns uses the deranged rantings of villain Syndrome to transform The Incredibles from a fun family romp into the bleak existential action flick it always wanted to be. All that is missing is Christian Bale's hoarse, grizzled voice as Mr. Incredible. To be fair, at least it's not as bad as Michael Bay directing Up.